Beer die is the celebrated game of many, where only the most dexterous, agile, and strong-livered will prevail. Beer die has many variations across the globe, but this guide will cover PPO-sanctioned rules. The game is found at any Blues Pub, and on rare occassions 4 à 7. To a common pleb, beer die may seem a confounded compilation of arbitrary rules, and they'd be right; nevertheless it is a sport that requires determination to master. In order to play beer die, very little is required; a table, at least one die, regulation cups, and some beer. Ideally the table will be between 4' and 8' (see below), give or take a few inches. The best material to play on is melamine, providing a strong and even bounce to the die. In truth any material can be used, but layers of paint, plywood, etc. often cause sporadic bouncing. The best six-sided dice have crisp, 90° edges, providing clean bounces. Rounded die are increasingly common, but they should be avoided at all costs. Seeing as one will get progressively inebriated as the game continues, multiple dice are recommended to save you the trouble of chasing after rogue die. The experienced drinker will know the importance of a good regulation cup, and the same ideology applies to beer die. If at all possible, regulation cups should be used in all instances of beer die. Red solo cups are a good substitute, but it's just not the same. Rolling in: If more than four players wish to take part in a game, it is resolved by rolling in. Each candidate rolls a single die, the two highest rollers are one team, the two lowest another. In the event that a team is on a winning streak, the roll is limited to only two spots. In this case only the two highest rollers would form a team. 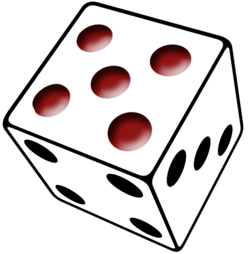 Roll for Side or throw: One die is rolled by each team. The team rolling the higher number gets to choose which side of the table they will sit on or whether they will throw first or second. The other team gets to make the remaining decision (throw or side). Games may be played between a team of two and a single player, between two single players, but doubles games are invariably the most fun. The scoring of a game is divided up into drinks and beers. Each beer consists of 4+1 drinks (see The Naughty Numbers). One drink can be any size a player wishes, so long as the player finishes the beer after 4+1 drinks are amassed (i.e. a player can chug their beer on their first or last drink, drink exactly 20% of the beer per drink, etc.). Drinks can be taken by a player for their partner, but not by outside parties. A game goes up to wah or, occasionally, wah-wah beers (see The Naughty Numbers) such as in a Championship Game. The number of beers is decided at the start, but may increase during the game by mutual agreement of both teams. The first team to finish the requisite number of beers loses the game. Yes, the losers drink the most. Everyone wins, really! One player from the first team (Player 1A) throws the die in the air. It must bounce on the far side of the table (beyond the halfway line). If it goes between the opposition’s cups (or off the end of the table in the case of a single opponent), they must attempt to catch it, cleanly, with one hand and no bobbling or trapping against the body. One player from the second team (Player 2A) team takes his/her turn throwing the die and thus establishes the order of throwing. This order must be retained for the rest of the game. Thus in our example, the order of throws would be: 1A, 2A, 1B, 2B, 1A. Once a team has finished a beer, their opponents get up and refill their cups. It is also considered polite to provide one’s opponents with the bottle caps used in filling their beers, so they may be flicked. Once a given team has consumed B-1 (with B being the total number of beers in the game) the Pants Rule comes into effect. The team which has reached B-1 must lower their pants to around their ankles. Alternatively the shirt may be removed in the case of lack of underwear, discomfort, setting, etc. The pants shall be worn around the ankles until either team has won the game. Many players frown on the wearing of “tighty whities,” but there is no official rule proscribing their wearing. A throw must be higher than a prescribed elevation. This elevation should be agreed upon at the start of the game. If a receiving team believes a throw to be low, they must announce this by calling “low,” or making the appropriate gesture while the die is still over the table. A throw may not be called low retroactively. Throws must be made underhand. If an overhand motion is used, the throw is considered “dead” and the rules listed above regarding the thrower's and catcher’s drinking obligations are used. Stambolich Rule: If a throw hits the ceiling of the room before hitting the table, no drinks can be assigned to either team due to that throw (again, a sink is the exception). Against a team of two, the die must bounce between or over the receiving team’s cups to be considered good. Against a single player, the die must leave the table over the short end of the table (not the sides) for the throw to be considered good. If the receiving team believes a throw to be outside, they must call “outside” or make the appropriate gesture before the die hits the ground. Outside calls can not be made retroactively. A throw which is acceptable in all other manners, but comes to a stop on the table is considered dead and no drinks are assessed, except in the case of the dreaded wah. A throw misses the table entirely. A throw bounces short of the center line and is called by the receiving team before said bounce. When a thrown die hits a cup, that team must drink. In the event that one throw hits multiple cups, a maximum of one drink per cup hit is possible (i.e. if one cup is hit twice only one drink is required). A player throws out of turn. A player mutters one of the unmentionable numbers, or any variations therein. A player's cup is not completely within the appropriate square when a throw is made. A false accusation of the "cup off" results in a drink for the offending team. A player attempts to catch the die over the table. Drinks cannot be taken from the game beer. If you really need one, a drink on the side is acceptable (see mistress). 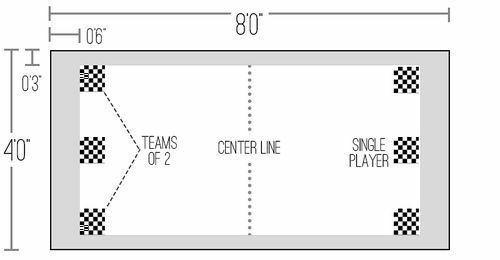 It is impossible to throw “out of team.” This means that if player 1B throws immediately after player 1A no drink is required. If the out of team throw is called by the opposition, the throw is simply called dead. The receiving team may not get out of taking a drink simply because a throw was out of turn. An out of turn throw means a penalty to the throwing team, but does not invalidate the throw. Once an out of turn throw has been successfully called and the penalty drink consumed, a new throwing order is established. (i.e. if player 2B threw after 1A, and an out of turn throw was called, either player 1A or 1B could throw, followed by either player 2A or 2B). No matter who throws, the new order established by these first two tosses must be maintained until the next out of turn throw is called. Jason Rutman Rule: In the event that neither team can recall the correct order of play, a new order is decided on at no penalty to either team. The Naughty Numbers are the numbers directly after four and six, hereafter wah and wah-wah respectively. Variations of the numbers are just as valid as the numbers themselves (e.g. number after 49, the fractional equivalent of 0.2, and so on). All languages apply. If ever a die comes to rest on the table on a wah, the team on the side the die landed must take a drink (originally the Cuba Rule). Alternatively some play where the receiving team always drinks. Once the beer is consumed, the player whose cup was sunk must take the die in their mouth and spit it on the table. If the die lands on a wah, the team must drink another full beer. Catching over the table to avoid a sink is legal, however it is considered poor etiquette and will still result in one drink. Bystanders beware: In the event that a third parties' beer is sunk by a die in play, said third party must chug the beer. While scheming, deviousness, and underhandedness is heavily encouraged in beer die, it is still a gentleman's game. Knowingly lying about the score or calls in general is forbidden, and will result in relentless mockery. Therefore, if you are uncertain about a call, do what is honourable. A team may revoke their call if desired. House rules are welcome and encouraged, and in fact may lead to a new form of beer die! The Buffalo Rule is often acknowledged at the beginning of a game, or not at all. The Buffalo Rule states that all drinks earned must be consumed with the non-dominant hand; in the event that the opposing team happens to catch the others drinking with the dominant hand, this results in chugging of the entire beer. If ever there is no mutually agreed-upon resolution, an arbitrator may be called in. First the question must be decided upon between the team, unbeknownst to the arbitrator. Then, proceed to ask the oblivious arbitrator "Yes, or no?" The arbitrator's decision is binding for that instance, no matter information provided thereafter. The Stambolich Rule is named after Beer Die veteran Leon Stambolich; a notorious drunkard, Stambolich would throw the die at the ceiling to ensure no penalties rather than attempt a proper throw. The Beer Die arbitrator term, "The-HALO" was originally the phone number to the apartment upstairs to the legendary SR4 Beer Die venue. This number was frequently called for arbitration. A drink consumed by a player outside of the game is known as a mistress. An exceptionally poor throw (e.g. one which is short and off the table) is known as an Ashenhurst after beer die player Andrew Ashenhurst, who had reasonable defensive skills but terrible throwing. A traditional Beer Die tournament runs in single elimination format, and calls for the finalists to play one regular game and two championship games all in one day, sometimes with preliminary rounds played the night prior. That's a maximum of 19 beers if the games are close! A team which finishes all wah of its beers before their opponents have finished their first is said to be twelved, as this is the number of beers consumed in such a game. The Cuba Rule, now commonplace, was originally developed during outdoor matches in, you guessed it, Cuba. This was due to the poor bounce of the makeshift table. Beer Die games may extend beyond the wah-wah beers of a Championship game. The San Remo Apartments used to house four permanent Beer die tables, including one on the roof. While Beer Die is most popular among engineers, it actually got its start at McGill in the McConnell Residence where members of all faculties enjoyed the game. In past years there was an All McGill Beer Die Tournament, at which engineers represented a minority of participants. It isn’t entirely clear where Beer Die was imported to McGill from, but it is certain that the game wasn’t invented here. This page was last edited on 3 May 2018, at 23:25.